CD8+ CTLs are adept at killing virally infected cells and cancer cells and releasing cytokines (e.g., IFN-γ) to aid this response. However, during cancer and chronic viral infections, such as with HIV, this CTL response is progressively impaired due to a process called T cell exhaustion. Previous work has shown that the glycoprotein T cell Ig and mucin domain–containing protein 3 (Tim-3) plays a functional role in establishing T cell exhaustion. Tim-3 is highly upregulated on virus and tumor Ag-specific CD8+ T cells, and antagonizing Tim-3 helps restore function of CD8+ T cells. However, very little is known of how Tim-3 signals in CTLs. In this study, we assessed the role of Tim-3 at the immunological synapse as well as its interaction with proximal TCR signaling molecules in primary human CD8+ T cells. Tim-3 was found within CD8+ T cell lipid rafts at the immunological synapse. Blocking Tim-3 resulted in a significantly greater number of stable synapses being formed between Tim-3hiCD8+ T cells and target cells, suggesting that Tim-3 plays a functional role in synapse formation. Further, we confirmed that Tim-3 interacts with Lck, but not the phospho-active form of Lck. 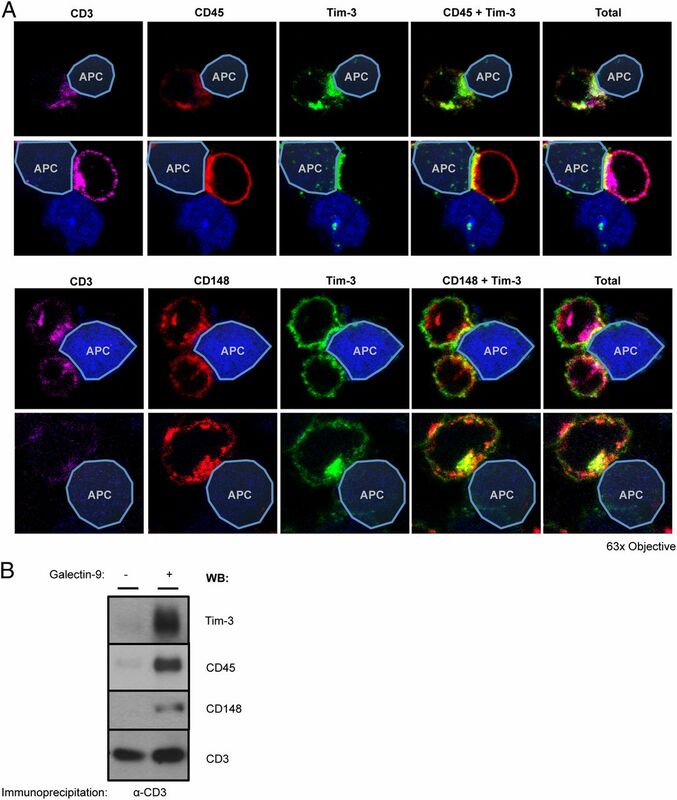 Finally, Tim-3 colocalizes with receptor phosphatases CD45 and CD148, an interaction that is enhanced in the presence of the Tim-3 ligand, galectin-9. Thus, Tim-3 interacts with multiple signaling molecules at the immunological synapse, and characterizing these interactions could aid in the development of therapeutics to restore Tim-3–mediated immune dysfunction. The immune system has developed multiple mechanisms to limit T cell responses to self-proteins to prevent autoimmunity. However, these mechanisms also limit T cell responses to cancer Ags and chronic infection (1, 2). During chronic infections, such as HIV type 1 and hepatitis C virus, CD8+ T cells become exhausted, causing CD8+ T cells to lose their effector function. Loss of production of IL-2 and TNF-α characterizes early exhaustion, whereas the production of IFN-γ is usually maintained until late-stage exhaustion (3–5). Increased expression of multiple negative, coinhibitory checkpoints, including programmed death receptor 1 (PD-1), has been associated with the exhausted phenotype. In addition, antagonizing these receptors with Abs or soluble fusion proteins results in partial rescue of effector function (6). We have previously shown that T cell Ig and mucin domain–containing protein 3 (Tim-3) is highly expressed on exhausted HIV-specific CD8+ T cells (4). Similar to the other coinhibitory receptors, Tim-3 blockade partially rescues the proliferation, cytokine production, and cytotoxicity of virus-specific CD8+ T cells, suggesting that Tim-3 plays a functional role in T cell exhaustion (4, 7). However, unlike PD-1, Tim-3 is relatively uncharacterized in terms of how it manipulates the cell to dampen T cell responses. Human Tim-3 is a type I transmembrane protein with extracellular Ig V-like and mucin domains with two N- and one O-linked glycosylation sites (8). Tim-3 is expressed at low levels on naive CD8+ T cells, Th1 and Th17 cells, and regulatory CD4 T cells, increased on activated CD8+ T cells, and constitutively expressed on NK cells, dendritic cells, monocytes, and macrophages (4, 9–15). Known ligands for murine Tim-3 include phosphatidylserine (16) and galectin-9 (17). The interaction between galectin-9 and Tim-3 is carbohydrate dependent (17), and as such, galectin-9’s carbohydrate-binding, lectin properties suggest that it may also interact or cointeract with other surface glycoproteins including CD44 (18) and integrins (19), allowing association with Tim-3. Currently, the galectin-9–induced Tim-3 signaling cascade is unknown. We and others have shown that exhausted Tim-3hi CD8+ T cells respond more efficiently to TCR stimulation when the Tim-3 pathway is blocked, suggesting that Tim-3 engagement antagonizes TCR signaling pathways (4, 5, 7, 20–23). Previous studies have investigated Tim-3 signaling in artificial systems such as cell lines and transfection systems. Tyrosine phosphorylation of the Tim-3 cytoplasmic tail and enhancement of this phosphorylation with addition of galectin-9 have been reported in epithelial cell lines (24, 25). In addition, Tim-3 was shown to bind to Fyn, p85 (the PI3K adaptor), and Lck (26, 27), further suggesting a role for Tim-3 in TCR proximal signaling. Finally, Tim-3 expression was shown to suppress NFAT dephosphorylation and AP-1 transcription (28). However, these reports did not study Tim-3 in the context of intact TCR signaling with concurrent galectin-9 engagement. In addition, the pathway still remains to be studied in primary human CD8+ T cells. In this study, we characterized the interaction between Tim-3 on primary human CD8+ T cells and early signaling events, which may lead to the exhausted phenotype of CD8+ T cells found in association with chronic viral infection or cancer. Healthy HIV-seronegative human volunteers were recruited for blood specimens obtained via leukophoresis. PBMCs were isolated using Ficoll-Paque PLUS (GE Healthcare Biosciences, Uppsala, Sweden). Informed consent was obtained in accordance with the guidelines for conduction of clinical research at the University of Toronto and St. Michael’s Hospital institutional ethics boards. CD8+ T cells were isolated using EasySep Human CD8+ T Cell Negative Enrichment Kit (StemCell Technologies, Vancouver, BC, Canada). Cells achieved a purity of at least 95%, assessed via flow cytometry. Isolated CD8+ T cells were cultured in R-10 medium (RPMI 1640, 10% FBS, 1 U/ml penicillin, 100 μg/ml streptomycin, 2 mM glutamine; Wisent, Saint-Bruno, QC, Canada) and stimulated with 1 μg/ml LEAF-purified anti-CD3 mAb (clone OKT3; BioLegend, San Diego, CA) and 1 μg/ml LEAF-purified anti-CD28 mAb (clone 28.8; BioLegend) with 50 U/ml rIL-2 (National Institutes of Health, Bethesda, MD) for 5–7 d to upregulate Tim-3 (29). Cells were then washed three times in R-10 and rested overnight in R-10 with no additional stimulation. For Tim-3 blocking experiments, cells were washed in R-10 medium and treated with 10 μg/ml LEAF-purified anti–Tim-3 antagonistic mAb (clone 2E2; BioLegend) or 10 μg/ml LEAF-purified isotype control Ab (BioLegend) overnight without additional stimulation. EBV-transformed patient B cells were cultured in R-10 for up to 20 passages. A total of 5 × 106 of rested Tim-3hi CD8+ T cells were harvested and resuspended in 20 μl TBS. The cells were lysed in 250 μl 0.5% Brij-58 TKM Lysis Buffer (50 mM Tris-HCl [pH 7.4], 25 mM KCl, 5 mM MgCl2, 1 mM EDTA, 1 mM NaVO4, and 5 mM NaF with 1× Roche Complete Mini EDTA-free Protease Inhibitor) for 30 min at 4°C and mixed with equal parts of 80% sucrose in TKM Buffer. The 36% sucrose in TKM Buffer (4.3 ml) was layered on top of the 40% sucrose cell lysate solution and subsequently layered with 5% sucrose in TKM Buffer (0.2 ml). The samples were ultracentrifuged at 50,000 rpm for 16 h at 4°C in a SW Ti-55 rotor (Beckman Coulter, Brea, CA) to isolate lipid rafts, which float to the top of the gradient (fraction 1), whereas nonlipid raft membrane should remain at the bottom of the gradient (fraction 10). The 0.5-ml fractions were collected from each 5-ml gradient. To assess the presence of lipid rafts, 100 μl each fraction was blotted onto nitrocellulose using a dot blot apparatus and probed with a 1:3000 dilution of cholera toxin–HRP (Sigma-Aldrich, Germany) to detect GM-1, a lipid raft–resident ganglioside. Soluble Tim-3 (sTim-3) was produced and purified as previously described (4) and biotinylated using the EZ-Link Sulfo-NHS-LC-Biotinylation Kit (Thermo Scientific, Rockford, IL). B cells were washed twice in 2% FBS/PBS and incubated with varying amounts of biotinylated sTim-3 per 3 × 105 cells for 30 min at 4°C with or without α-lactose followed by staining with streptavidin-APC (Invitrogen, Carlsbad, CA). B cells were also stained with Galectin-9–PE (BioLegend). Expression of Tim-3 on activated CD8+ T cells was assessed via staining with anti-CD8 and anti–Tim-3–PE (R&D Systems, Minneapolis, MN; catalog number FAB2365P). Data were acquired on a BD FACSCalibur (BD Biosciences) and analyzed on FlowJo software (Tree Star). B cell–T cell conjugates were prepared as described in (30) with some modifications. Briefly, B cells were labeled with Cell Tracker Blue CMAC (Invitrogen) and incubated with 2 μg/ml Staphylococcal enterotoxin B (SEB; Sigma-Aldrich) for 30 min at 37°C. Rested or Tim-3–blocked Tim-3hi CD8+ T cells were mixed 2:1 with the B cells and spun at 200 × g for 5 min, gently resuspended, and further incubated for 10 min at 37°C. The cells were placed onto poly-l-lysine–coated coverslips and allowed to adhere for 15 min. The coverslips were gently rinsed with PBS and fixed with 4% methanol-free formaldehyde for 15 min at 37°C. Cells were washed with PBS and then permeabilized using 0.2% Triton X-100 for 5 min at room temperature then washed with PBS. Blocking was performed using 10% BSA for 1 h at room temperature followed by primary Ab incubation overnight at 4°C using combinations of anti–Tim-3 (R&D Systems; catalog number AF2365), anti-CD3 (Abcam, Cambridge, U.K.; catalog number ab5690), anti–phospho-ERK1/2 (R&D Systems; catalog number MAB1018), phospho-Lck Y394 (R&D Systems; catalog number MAB7500), anti-CD45 (Abcam; catalog number ab33533), and anti-CD148 (Abcam; catalog number ab140236) Abs. Following subsequent washes in PBS, the coverslips were then incubated with appropriate secondary Ab mixes for 45 min at 37°C. Coverslips were mounted on slides using N-propyl gallate mounting buffer and sealed. The slides were analyzed using a Zeiss LSM700 Confocal Microscope (Carl Zeiss) with a 63× oil immersion objective. Images of T cells, which formed an immunological synapse, were analyzed using LSM Zen LE 2011 Acquisition Software. For semiquantification of stable synapses, slides were analyzed using an epifluorescent microscope with 60× oil immersion objective. Representative pictures were taken and analysis was performed using ImageJ software (National Institutes of Health). Pictures were taken of multiple fields of view, and 25 pairs of T cell–B cell conjugates were counted per slide. Stable synapses were defined as a T cell–B cell conjugate with concentrated CD3 at the interface between the two cells, and the T cell was phospho-ERK+. Unstable synapses were defined as a T cell–B cell conjugate in which CD3 was not concentrated at the interface between the two cells or the T cell was not phospho-ERK+. Only conjugates with a Tim-3+ T cell were included in the counts. The number of stable synapses was blindly counted per 25 pairs of T cell–B cell conjugates. A total of 1.5 × 107 rested Tim-3hi CD8+ T cells were washed in PBS, resuspended in 1 ml serum-free media, and then incubated at 37°C for 10 min. Cells were treated with or without 1 mM pervanadate for 5 min at room temperature and then lysed in 0.5 ml Nonidet P-40 Lysis Buffer (Invitrogen) at 4°C for 30 min. Cleared lysate was incubated with isotype or Tim-3 Ab (R&D Systems; catalog number AF2365) coupled Protein-G Dynabeads (Invitrogen) for 3 h at 4°C. Beads were washed five times with 1 ml ice-cold lysis buffer, and bound protein was eluted in LDS sample buffer with 50 mM DTT (Invitrogen). For anti-CD3 immunoprecipitations, 2 × 106 rested Tim-3hi CD8+ T cells were pretreated with anti-CD3 Ab-coupled Dynabeads (Invitrogen) for 30 min followed by addition of buffer or in-house produced recombinant galectin-9 for 1 h. The cells were lysed in 0.5% Brij-58 TKM lysis buffer, and anti-CD3 beads were collected. CD3-immunoprecipitated protein was eluted in LDS sample buffer with 50 mM DTT (Invitrogen). Samples were prepared in LDS sample buffer and 50 mM DTT as per the manufacturer’s instructions and analyzed via 4–12% Bis-Tris SDS-PAGE with subsequent Western blotting. Membranes were probed using anti-phosphotyrosine (EMD Millipore, Billerica, MA; catalog number 05-321), anti–Tim-3 (R&D Systems; catalog number AF2365), anti-Lck (Abcam; catalog number ab3885), anti-CD45 (Abcam; catalog number ab33533), anti-CD148 (R&D Systems; catalog number AF1934), and anti-CD3 (Abcam; catalog number ab5690) Abs followed by the appropriate L-chain–specific secondary Abs (Jackson ImmunoResearch Laboratories, West Grove, PA). Detection was performed using chemiluminescence (Thermo Scientific). The medium isoform of human galectin-9 (UNIPROT ID: O00182-2) with a C-terminal 3XFLAG tag was codon optimized and subcloned into a pET15b vector. Following expression in ArcticExpress (DE3) competent cells (Agilent Technologies, Palo Alto, CA), the cells were induced with 0.5 mM isopropyl β-d-thiogalactoside and incubated at 12°C for 24 h. Cells were harvested and lysed using B-PER protein extraction reagent (Thermo Scientific) as per the manufacturer’s instructions. The lysate was cleared via centrifugation at 25,000 × g for 30 min at 4°C. Functional galectin-9 was isolated using α-lactose agarose (Sigma-Aldrich) and eluted using 200 mM α-lactose. Polishing purification was performed using a Superdex 75 (GE Healthcare, Buckinghamshire, U.K.) via AKTA HPLC. A purity >90% was obtained (assessed via SDS-PAGE and Coomassie and silver staining analysis), and endotoxin was <1 EU/mg protein. Identity of the protein was confirmed via galectin-9 Western blot (R&D Systems; catalog number AF2045). The binding of recombinant human galectin-9 to recombinant human sTim-3 was tested using a Biacore X instrument (GE Healthcare). A CM5 chip was coupled with 1.82 ng sTim-3 at pH 4.5 (equivalent to 1820 response units). A 2-fold serial dilution of recombinant human galectin-9, from 563 to 18 nM, was injected over the sTim-3 surface, and the change in response units was measured. A total of 10 μg in-house–produced recombinant galectin-9 was immobilized onto magnetic anti-FLAG beads (Sigma-Aldrich) and incubated with RIPA (Cell Signaling Technology, Beverly, MA) lysate prepared from 5 × 106 rested Tim-3hi CD8+ T cells for 3 h at 4°C. Following collection of the flow-through and subsequent washing with lysis buffer, bound proteins were first eluted with 200 mM α-lactose in lysis buffer followed by a subsequent denaturing elution in LDS sample buffer with 50 mM DTT. Lysate, flow-throughs, and elutions were analyzed via SDS-PAGE and Western blotting or in-gel silver staining (Sigma-Aldrich). Silver-stained bands were excised from the gel and sent for in-gel tryptic digestion and identification via liquid chromatography-tandem mass spectrometry. Analysis of peptide hits was performed using Scaffold 4 software. TCR signaling predominantly occurs within distinct membrane microdomains called lipid rafts (31, 32). Productive TCR signaling requires shuttling of essential proximal signaling molecules in and out of the rafts during initial interaction with the target cell (33). We tested whether Tim-3 could be found within lipid rafts of CD8+ T cells. To do this, primary human CD8+ T cells were obtained from peripheral blood of normal human volunteers, and stimulated in culture for 5–7 d with anti-CD3, anti-CD28, and IL-2 to upregulate Tim-3 as previously described in Mujib et al. (29). Following in vitro stimulation, the cells were washed three times to remove residual Abs and IL-2, and the cells were rested overnight in plain medium to dampen any residual proximal signaling. The representative flow cytometry plots in Fig. 1A confirm Tim-3 expression on the CD8+ T cells used in all assays. Assessment of Tim-3′s membrane location in these primary rested Tim-3hi CD8+ T cells using sucrose density gradient purification revealed the presence of a large amount of Tim-3 in lipid rafts (Fig. 1B). Approximately 40% of total cellular Tim-3 was found in the first fraction collected from the sucrose gradient, which contained ∼87% of GM-1, a lipid raft ganglioside. Lipid raft clustering is required for immunological synapse assembly (34), which provided us with a rationale to further investigate the role of Tim-3 at the immunological synapse. Tim-3 is found in lipid rafts and is recruited to the immunological synapse. (A) Tim-3 expression on in vitro–activated CD8+ T cells. Isolated CD8+ T cells from whole PBMCs were activated in vitro for 5–7 d then washed, rested overnight in plain medium, and Tim-3 expression was assessed via flow cytometry. (B) Rested Tim-3hi CD8+ T cells were lysed and subjected to sucrose gradient centrifugation followed by fraction collection to isolate lipid rafts. Fractions were subjected to dot blot analysis using cholera toxin–HRP to detect lipid raft–resident protein GM-1 or Tim-3 using Western blot (WB). Fraction 1 contains the lipid rafts. Densitometry analysis using ImageJ (National Institutes of Health) was used to determine the fraction of total Tim-3 and GM-1 in fractions 1–3 and 8–10. (C) Rested Tim-3hi CD8+ T cells were used to form conjugates with Cell-Tracker Blue–stained, SEB-loaded B cells followed by indirect immunofluorescent staining for CD3 (magenta, marker of the central supramolecular activation cluster) with Tim-3 (green) and analyzed via confocal microscopy. White indicates colocalization. Original magnification ×630. Figure is representative of five experiments. FSC, Forward light scatter; SSC, side scatter. Formation of an immunological synapse requires a T cell in conjugate with a target cell to provide a TCR stimulus and surface ligands/receptors on both cells to coordinate multiple costimulatory/inhibitory and immune accessory molecules (35, 36). In order to assess for immunological synapse formation, we used and modified a previous system (30) in which effector CD8+ T cells are coincubated with B cell lines as APCs that are pulsed with SEB as the Ag. To confirm the presence of endogenous Tim-3 ligand expressed on APCs, we employed a biotinylated recombinant sTim-3 with labeled streptavidin secondary to stain our target cells (human B cell line). The B cells bound labeled sTim-3, indicating the presence of the Tim-3 ligand on their surface. In addition, the cells stained for an Ab to galectin-9, a Tim-3 ligand (Supplemental Fig. 1A, 1B), indicating that surface associated galectin-9 was present on these cells. To confirm that galectin-9 was acting as the ligand, we treated the cells with sTim-3 in the presence of α-lactose, a galectin-9 substrate. This significantly inhibited the binding of the sTim-3 (Supplemental Fig. 1B), suggesting that galectin-9 was a major ligand for Tim-3 on these cells. However, α-lactose treatment of B cells did not completely abrogate sTim-3 binding, indicating that either there were noncarbohydrate-dependent ligands for Tim-3 on these B cells, as previously described (37), or the affinity of galectin-9 for α-lactose was less than that for Tim-3. Thus, we have confirmed that in the CTL/B cell line system that we will be using to model TCR stimulation, the requisite receptors and ligands are present to allow for simultaneous Tim-3 engagement. 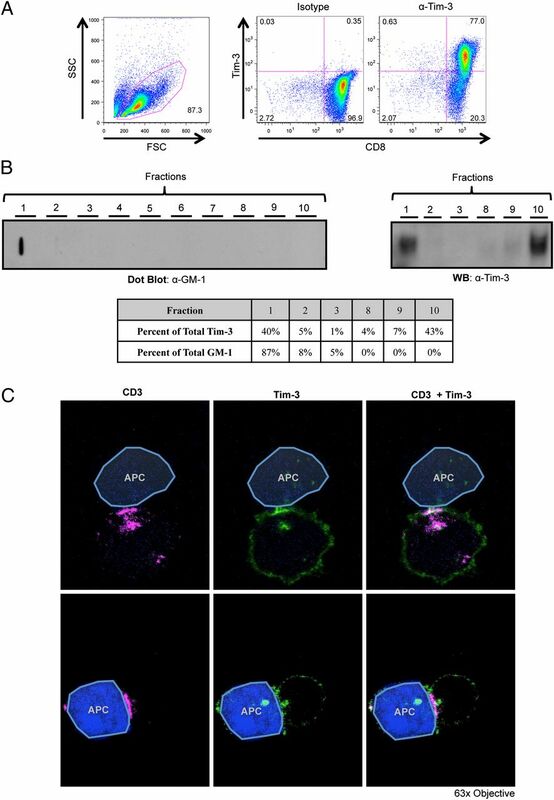 Following conjugate formation with rested Tim-3hi CD8+ T cells and the target (i.e., SEB-loaded B cells), the cells were stained for CD3 (as a marker for the central supramolecular activation cluster) and Tim-3 and then analyzed via confocal microscopy. As shown in Fig. 1C, Tim-3 was recruited to the immunological synapse, suggesting a role for Tim-3 in proximal TCR signaling. Similarly, PD-1 has also been found at the immunological synapse and negatively effects synapse stability, as defined by concentrated and centered CD3 at the T cell synapse (38). Using our conjugate-forming assay, we assessed whether blocking Tim-3 had an effect on synapse stability. Using epifluorescence microscopy, we defined stable synapses as conjugates with concentrated CD3 at the interface between the T cell and APC. In addition, to increase the stringency of our approach, we included phospho-ERK signaling, which results from an integration of signals from both the TCR and activated LFA-1 (39), as an additional parameter to define a stable synapse, which is capable of eliciting downstream signaling. Representative pictures of a stable and unstable synapse are shown in Fig. 2A. Blocking Tim-3 overnight on resting Tim-3hi CD8+ T cells using the antagonistic Tim-3 mAb (10) significantly increased the number of stable synapses formed between T cells and their SEB-pulsed targets to 54(± 3.8)% compared with 32(± 2.8)% for the isotype control (Fig. 2B). This suggests that Tim-3 signaling plays a role in stable synapse formation. Blocking Tim-3 enhances synapse formation. (A) Tim-3hi CD8+ T cells were rested overnight with either an isotype control or the antagonistic Tim-3 mAb 2E2 and subjected to conjugate formation and subsequent immunofluorescence staining with Cell-Tracker Blue–stained, SEB-loaded B cells. Depicted are a T cell–B cell conjugate with a stable synapse (top panel) and a T cell–B cell conjugate with an unstable synapse (bottom panel). Stable synapses were defined as a T cell–B cell conjugate with concentrated CD3 at the interface between the two cells, and the T cell was phospho-ERK+. Unstable synapses were defined as a T cell–B cell conjugate in which CD3 was not concentrated at the interface between the two cells or the T cell was not phospho-ERK+. Only conjugates with a Tim-3+ T cell were included in the counts. Shown are representative synapses taken from the anti–Tim-3 Ab–treated conditions. Original magnification ×600. (B) Bar graph showing the difference in frequency of stable synapse formation between cells treated with the isotype control or antagonistic Ab 2E2. For semiquantification of stable synapses, pictures were taken of multiple fields of view, and 25 pairs of T cell–B cell conjugates were blindly counted per slide. Statistical analysis was performed using a two-tailed paired Student t test from four independent experiments. Given that Tim-3 is localized in lipid rafts, which are crucial to immunological synapse formation, and that Tim-3 is located at the immunological synapse, we postulated that Tim-3 plays a role in proximal signaling events. Proximal signaling is regulated, in part, by tyrosine phosphorylation. Although previous studies have shown that Tim-3 can be phosphorylated in epithelial cell lines and is enhanced by addition of galectin-9 (24, 25), it is still undetermined if this is the case in primary CD8+ T cells. Although attempts were made to determine Tim-3's phosphorylation status with ligand treatment, we found that the addition of galectin-9 rendered Tim-3 insoluble even in harsh RIPA buffer, which hindered subsequent Tim-3 immunoprecipitation (data not shown). In addition, we could not detect Tim-3 phosphorylation during TCR stimulation, with or without galectin-9 (data not shown). However, it is possible that only a very small fraction of Tim-3 is being phosphorylated during TCR stimulation. To assess the potential for Tim-3 phosphorylation, we immunoprecipitated Tim-3 from rested Tim-3hi CD8+ T cells treated with or without pervanadate, a potent phosphatase inhibitor, and analyzed the elutions via Western blot. Under these conditions, Tim-3 was found to contain phosphorylated tyrosine motifs (Fig. 3A), further suggesting Tim-3′s involvement in proximal signaling. Probing for additional proximal signaling molecules revealed that Tim-3 coimmunoprecipitated with Lck, confirming previous findings (27), but this binding, however, was not dependent upon Tim-3 phosphorylation (lane 1, Fig. 3A). In addition, assessment of conjugates between Tim-3hi CD8+ T cells and SEB-loaded B cells revealed that Tim-3 colocalized minimally, if not at all, with the active form of Lck (p-Y394) at the immunological synapse (Fig. 3B, top panel). Interestingly, large, concentrated areas of active phospho-Lck appeared to exclude Tim-3 (Fig. 3B, bottom panel). This suggests the possibility that Tim-3 may be recruiting a phosphatase to dampen Lck phosphorylation and subsequent activity. Tim-3 interacts with Lck. (A) Rested Tim-3hi CD8+ T cells were treated with or without pervanadate, and Tim-3 was immunoprecipitated following lysis of the cells. Elutions and lysate were analyzed via SDS-PAGE and Western blotting (WB) for phospho-tyrosine (pY), stripped, and reprobed for Tim-3, followed by Lck. (B) Rested Tim-3hi CD8+ T cells were used to form conjugates with Cell-Tracker Blue–stained, SEB-loaded B cells followed by indirect immunofluorescent staining for CD3 (magenta), phospho-Y394 Lck (p-Y394 Lck; red), and Tim-3 (green) and analyzed via confocal microscopy. Yellow indicates colocalization of p-Y394 Lck and Tim-3, whereas white indicates colocalization of CD3 and Tim-3. Figure is representative of three experiments. Original magnification ×630. A previous study has demonstrated that mouse Tim-3 binds to mouse galectin-9 (17); however, the data are unresolved on this interaction in humans. To assess the binding of human Tim-3 to human galectin-9, we first produced and purified a FLAG-tagged recombinant human galectin-9 (Supplemental Fig. 2A). Next, we performed two independent surface plasmon resonance experiments to show that immobilized recombinant human Tim-3 was able to bind to recombinant human galectin-9 (Supplemental Fig. 2B). Results were comparable using our in-house produced recombinant human galectin-9 and human soluble Tim-3 and recombinant proteins obtained from R&D Systems (data not shown). However, because the interaction between galectin-9 and Tim-3 is carbohydrate dependent, endogenous, surface-expressed Tim-3 might have a different glycosylation state, which may prevent it from binding to galectin-9. We performed a galectin-9 affinity precipitation to determine if our recombinant human galectin-9 was able to precipitate endogenous Tim-3 from Tim-3hi CD8+ T cells. Galectin-9 bound to endogenous Tim-3 in a carbohydrate-dependent manner, as shown by the presence of Tim-3 in the α-lactose elution (Fig. 4A, lane 4). Following the α-lactose elution, any remaining proteins were removed via boiling/denaturing elution (Fig. 4A, lane 5). A large portion of Tim-3 was found in the denaturing elution, indicating that either the 200 mM α-lactose elution could not completely disrupt the interaction between Tim-3 and galectin-9 or that Tim-3 is also able to bind to galectin-9 in a noncarbohydrate-dependent manner. 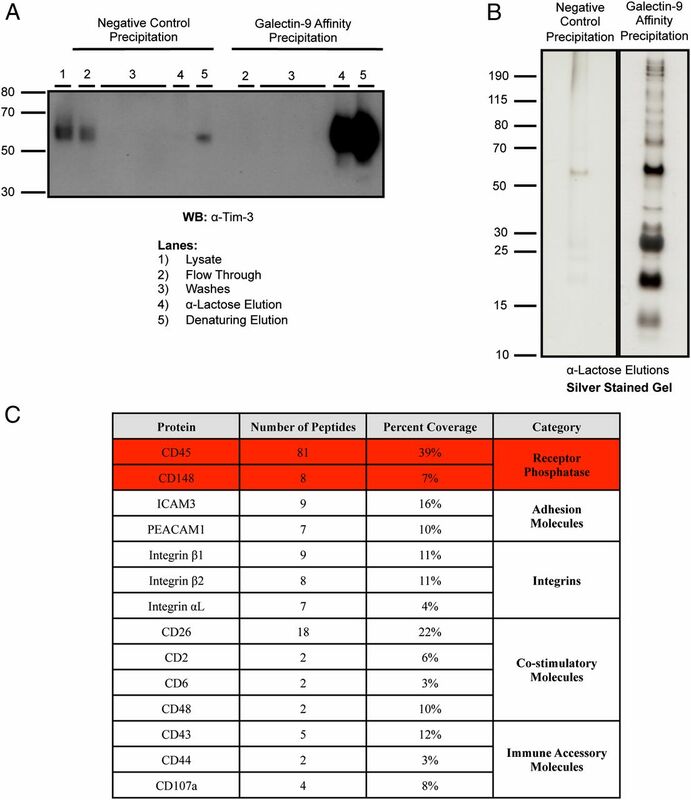 In order to determine other binding partners of galectin-9, besides Tim-3, the α-lactose elutions were analyzed via SDS-PAGE and silver staining. As shown in Fig. 4B, multiple proteins bound to galectin-9 in a carbohydrate-specific manner. Mass spectrometry analysis identified most of these proteins as immune accessory molecules, including the phosphatases CD45 and CD148 (Fig. 4C). This suggests that although galectin-9 is the ligand for Tim-3, it is able to coordinate multiple surface receptors, including receptor phosphatases. Galectin-9 binds to multiple immune accessory molecules including receptor phosphatases CD45 and CD148. (A) Bead-immobilized recombinant galectin-9 or beads alone (negative control) were incubated with lysate from rested Tim-3hi CD8+ T cells. Bound proteins were eluted with 200 mM α-lactose followed by a subsequent boiling/denaturing elution in reducing sample buffer. Lysate, flow-throughs, and elutions were analyzed via SDS-PAGE and Western blotting (WB) for Tim-3. (B) In addition, α-lactose elutions were analyzed via SDS-PAGE and subsequent silver staining. Differential bands were excised from the galectin-9 affinity precipitation α-lactose elution and sent for liquid chromatography-tandem mass spectrometry identification. (C) Analysis of the mass spectrometry results using Scaffold 4 software yielded identification of multiple immune accessory molecules and receptor phosphatases. Because galectin-9 has two carbohydrate recognition domains joined by a flexible linker, it is possible that galectin-9 may colocalize Tim-3 with CD45 or CD148, allowing Tim-3 to associate with a phosphatase in a ligand-dependent manner. Assessment of conjugates between Tim-3hi CD8+ T cells and SEB-loaded B cells showed that Tim-3 colocalized with CD45 and CD148 at the immunological synapse formed between Tim-3hi CD8+ T cells and Tim-3 ligand–expressing APCs (Fig. 5A). Interestingly, addition of recombinant galectin-9 to Tim-3hi CD8+ T cells during CD3 engagement resulted in accumulation of Tim-3, CD45, and CD148 within CD3 signaling complexes, as shown by CD3 immunoprecipitation and subsequent Western blotting (Fig. 5B). These data suggest that Tim-3 may mediate its inhibitory function through the recruitment of the receptor phosphatases to the synapse via its ligand, galectin-9. Tim-3 colocalizes with receptor phosphatases, an interaction that is enhanced in the presence of galectin-9. (A) Rested Tim-3hi CD8+ T cells were used to form conjugates with Cell Tracker Blue–stained, SEB-loaded B cells followed by indirect immunofluorescent staining for CD3 (magenta), Tim-3 (green), and either CD45 (red, top panel) or CD148 (red, bottom panel) and analyzed via confocal microscopy. Yellow indicates colocalization. The following are two representative pictures of four experiments. Original magnification ×630. (B) Rested Tim-3hi CD8+ T cells were pretreated with anti-CD3 beads followed by addition of buffer or recombinant galectin-9. The cells were lysed, and anti-CD3 beads were collected. CD3-immunoprecipitated protein was eluted using reducing sample buffer and analyzed via SDS-PAGE and Western blot (WB) for Tim-3. The blot was stripped and reprobed for CD45, CD148, and CD3. Figure is representative of three experiments. Our study provides novel insight into the Tim-3 receptor coordination during immunological synapse formation and involvement in proximal TCR signaling. In this study, we show that human Tim-3 is found in lipid rafts and recruited to the immunological synapse. Further, Tim-3 may be involved in the process of stable synapse formation, suggesting a role for Tim-3 in proximal signaling. Tim-3 was found to have the potential for tyrosine phosphorylation in primary CD8+ T cells and bind to Lck, further confirming the finding by Rangachari et al. (27) that Tim-3 associates with this essential proximal signaling molecule. However, Tim-3 was not found to associate with the active form of Lck, phospho-Y394, at the synapse, suggesting that Tim-3 may be recruiting a phosphatase. Interestingly, in addition to confirming galectin-9 as the Tim-3 ligand, we described novel interactions between galectin-9 and receptor phosphatases CD45 and CD148. Finally, galectin-9 was able to enhance the interaction between these phosphatases and Tim-3 within CD3 signaling complexes. These data suggest the possibility that Tim-3 may regulate Lck function via interaction with CD45 or CD148 at the synapse, an interaction mediated by its ligand galectin-9. Proximal TCR signaling is a complex process regulated not only by posttranslational modifications, including tyrosine phosphorylation, but also by lipid raft dynamics and compartmentalization of proteins. For T cells to initiate signaling, first the peptide-loaded MHC interacts with the TCR. This results in recruitment to the lipid rafts and exclusion of CD45 (33). Fyn and/or non-CD8–bound Lck become associated with the TCR–CD3 signaling complex, resulting in phosphorylation of CD3 ITAMs and recruitment of ZAP70. Following ZAP70 phosphorylation, the Src homology 2 (SH2) domain of CD8-bound Lck binds to phospho-ZAP70, recruiting CD8 to the MHC–TCR complex. CD8 binds to the MHC, increasing the stability of the MHC–TCR complex (40), sustaining proximal signaling and initiation of downstream signaling. The finding that >40% of Tim-3 resides in lipid rafts and is recruited to the immunological synapse provides evidence that Tim-3 is involved in proximal signaling. Although this study assessed membrane location of Tim-3 on resting cells, further work is warranted to determine if Tim-3 accumulates within or is excluded from lipid rafts during TCR signaling, similar to Lck and CD45, respectively. However, because TCR triggering results in the accumulation of lipid rafts at the synapse (34), it is likely that Tim-3 would accumulate. In addition, we found that blocking Tim-3 using the antagonistic Ab 2E2 resulted in significantly more conjugates that had stable synapses. Initial proximal TCR signaling, such as Lck phosphorylation and subsequent downstream signaling to linker for activation of T cells, is required for stable synapse formation (41), further providing evidence that Tim-3 is involved in TCR proximal signaling. Although the exact mechanism of how Tim-3 effects proximal signaling is still under investigation, our work provides preliminary evidence that Tim-3 may be involved in Lck regulation. Our finding that Tim-3 binds to Lck is not novel (27); however, we did show that this interaction occurred in primary human CD8+ T cells. In addition, we showed that Tim-3 did not localize with the active form of Lck, phospho-Y394. 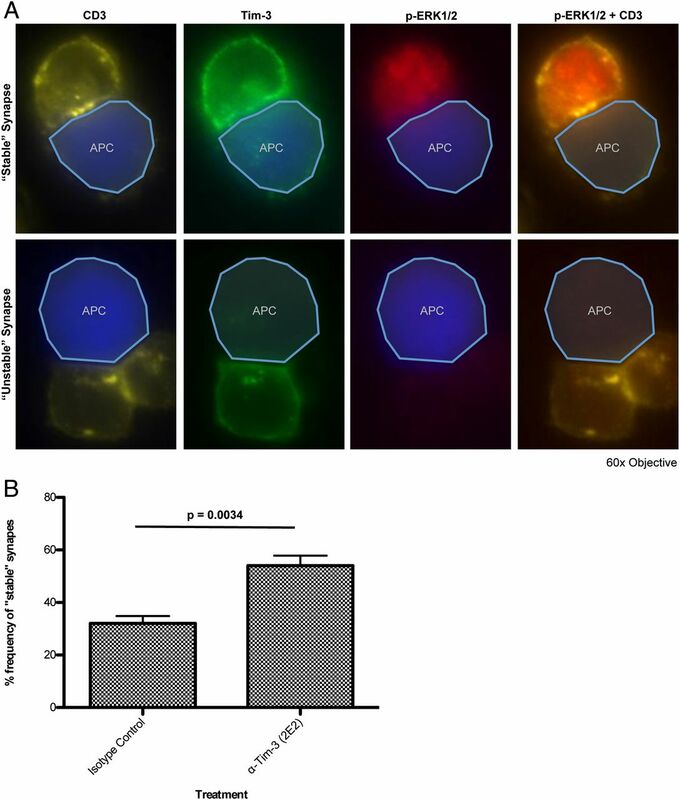 Lck activity is regulated via phosphorylation of the positive regulatory tyrosine Y394 in the kinase domain and the negative regulatory tyrosine Y505 in the C-terminal end (33). When Y505 is phosphorylated, it forms a bond with its own SH2 domain, preventing substrate access to the kinase domain. However, when Y394 is phosphorylated, the protein achieves full kinase activity. It would be prudent to assess Tim-3′s location in relation to the inactive form of Lck (pY505) versus the active form of Lck (pY394); however, the inactive form pY505 is bound to its own SH2 domain, preventing access to the phosphorylated motif by any Ab used for immunofluorescence. Thus, we are unable to assess, given currently available reagents, whether Tim-3 preferentially binds pY505 Lck. However, directly assessing Lck activity in Tim-3 immunoprecipitates using immune complex kinase assays would be more accurate rather than inferring activity based on the phosphorylation state of Tim-3–precipitated Lck. Thus, further studies to characterize the activity of Tim-3–associated Lck are warranted. Phosphorylation of Y505 and Y394 are achieved by the kinase Csk and via trans/autophosphorylation, respectively (33). Dephosphorylation of either tyrosine is mediated by the receptor phosphatase CD45. Interestingly, CD45 plays a dual role in positively and negatively regulating Lck, depending on the expression level of CD45 (42). Low to intermediate concentrations of CD45 result in dephosphorylation of Lck at Y505, resulting in an increase in Lck activity. However, high levels of CD45 result in dephosphorylation of Y394, effectively decreasing Lck kinase activity. Despite a recent study that claimed human Tim-3 was not the receptor for human galectin-9 (43), we confirmed that galectin-9 was the physiological ligand for Tim-3 using two different biochemical assays. In addition, we discovered that galectin-9 bound to receptor phosphatases CD45 and CD148, suggesting a possible mechanism of how Tim-3 could regulate Lck activity. Inducing high local concentrations of CD45 in proximity to Tim-3 and associated Lck could result in dephosphorylation of Lck Y394 and Y505. In addition, we showed that galectin-9 was able to increase levels of Tim-3, CD45, and CD148 within CD3 signaling rafts. Thus, although CD45 and CD148 are normally excluded from the synapse (33, 44), concurrent ligation of these receptor phosphatases with Tim-3 via galectin-9 could enhance the presence of these phosphatases at the synapse, resulting in negative regulation of Lck as well as dampening of TCR signaling. Importantly, all of this work was performed using primary CD8+ T cells with minimal manipulation of the T cells or target cells. Although Tim-3 expression was induced via in vitro stimulation, no proteins were ever overexpressed, which can lead to artificial results and false positives, such as chaperones binding to overexpressed proteins (45). In addition, this work studied Tim-3 under near physiological conditions. Use of primary CD8+ T cells provides an intact TCR signaling platform, including presence of proximal signaling molecules, regulation via lipid raft dynamics, and presence of receptor phosphatases that are essential for the initiation and final dampening of TCR signaling (44, 46, 47). This is absent in many of the cell lines used to study Tim-3 thus far (24, 25, 27). In addition, our system uses SEB loaded on target cells to provide a TCR stimulus, which does not bypass proximal signaling, unlike the PMA/ionomycin stimulus used to study Tim-3 (28). Finally, we provide a target cell, which expresses the physiological Tim-3 ligand as shown by sTim-3 binding to the B cell in a carbohydrate-specific manner. This is essential because previous studies have engaged Tim-3 using putative agonistic Abs (13, 27). Galectin-9 is a soluble protein, not a transmembrane protein, like programmed death ligand-1 and programmed death ligand-2. It can associate with the membrane via interaction with other glycans; however, its behavior during T cell engagement and synapse formation is currently unknown, stressing the importance to understand how galectin-9 effects Tim-3 before using Abs to engage Tim-3. Indeed, using a galectin-9 affinity precipitation, we did show that galectin-9 was able to bind to various immune accessory molecules. Thus, the Tim-3–galectin-9 interaction is not a closed system but a complex interplay with various other surface glycosylated molecules. Although tempted to use agonistic Abs to study the effects of Tim-3, the reality is that when Tim-3 is engaged under physiological conditions, so are other receptors, including receptor phosphatases like CD45. Using the data we have collected, we wish to propose a working model. In the case of Tim-3 expressed on the T cell and galectin-9 expressed on the surface of the APCs, both CD45 and Tim-3 get recruited to the TCR signaling clusters at the immunological synapse. This results in CD45-mediated dephosphorylation of the active tyrosine (Y394) of Lck, and accumulation of inactive Lck within TCR signaling clusters. This increases the ratio of inactive Lck to active Lck and eventual dampening of TCR signaling. These results, thus far, are observational, and future functional investigations focusing on the Tim-3 intracellular pathway and galectin-9–mediated effects using our physiological T cell/APC system are warranted. Efforts need to be made to understand the signaling pathways associated with coinhibitory receptors to allow for better development of therapeutic interventions. The signaling pathways for coinhibitory receptors CTLA-4 and PD-1 are currently known. In addition, these proteins have antagonistic Abs currently used in clinic or in phase III trials, respectively, for cancer treatment (48). Coinhibitory molecules are not redundant, as shown by the synergistic effects of dual blockade. This stresses the importance of understanding what specific effects each inhibitory receptor has on T cell function to better formulate blockades that are most effective against different diseases such as cancer and chronic viral infections. We thank Dr. Michael Julius for help and expertise with the lipid raft isolation, Dr. Andrew Wilde for the use of microscope equipment, Dr. Walid Houry for help and expertise with the protein purifications and use of equipment, and Dr. R. Brad Jones for helpful comments. This work was supported by a grant from the Canadian Institutes for Health Research. K.L.C. and M.A.O. received salary support from the Ontario HIV Treatment Network. T cell Ig and mucin domain–containing protein 3. 2012. The blockade of immune checkpoints in cancer immunotherapy. Nat. Rev. Cancer 12: 252–264.
. 2007. The function of programmed cell death 1 and its ligands in regulating autoimmunity and infection. Nat. Immunol. 8: 239–245.
. 2010. HCV-specific T cells in HCV/HIV co-infection show elevated frequencies of dual Tim-3/PD-1 expression that correlate with liver disease progression. Eur. J. Immunol. 40: 2493–2505.
. 2012. Tim-3 negatively regulates cytotoxicity in exhausted CD8+ T cells in HIV infection. PLoS ONE 7: e40146.
. 2009. TIM-3 is expressed on activated human CD4+ T cells and regulates Th1 and Th17 cytokines. Eur. J. Immunol. 39: 2492–2501.
. 2008. Galectin-9 suppresses the generation of Th17, promotes the induction of regulatory T cells, and regulates experimental autoimmune arthritis. Clin. Immunol. 127: 78–88.
. 2007. Galectin-9 inhibits CD44-hyaluronan interaction and suppresses a murine model of allergic asthma. Am. J. Respir. Crit. Care Med. 176: 27–35.
. 2011. Galectin-9 binding to cell surface protein disulfide isomerase regulates the redox environment to enhance T-cell migration and HIV entry. Proc. Natl. Acad. Sci. USA 108: 10650–10655.
. 2011. Dysregulation of TIM-3-galectin-9 pathway in the cystic fibrosis airways. J. Immunol. 186: 2897–2909.
. 2012. Bat3 promotes T cell responses and autoimmunity by repressing Tim-3–mediated cell death and exhaustion. Nat. Med. 18: 1394–1400.
. 2012. Down-regulation of interleukin-2 production by CD4(+) T cells expressing TIM-3 through suppression of NFAT dephosphorylation and AP-1 transcription. Immunobiology 217: 986–995.
. 2012. Antigen-independent induction of Tim-3 expression on human T cells by the common γ-chain cytokines IL-2, IL-7, IL-15, and IL-21 is associated with proliferation and is dependent on the phosphoinositide 3-kinase pathway. J. Immunol. 188: 3745–3756.
. 2008. Chronic lymphocytic leukemia T cells show impaired immunological synapse formation that can be reversed with an immunomodulating drug. J. Clin. Invest. 118: 2427–2437. 2006. Lipid rafts in T cell receptor signalling. Mol. Membr. Biol. 23: 49–57.
. 2012. Lck, Membrane Microdomains, and TCR Triggering Machinery: Defining the New Rules of Engagement. Front. Immunol. 3: 155.
. 2002. Wiskott-Aldrich syndrome protein regulates lipid raft dynamics during immunological synapse formation. Immunity 17: 157–166.
. 2006. Immunological synapse and microclusters: the site for recognition and activation of T cells. Curr. Opin. Immunol. 18: 305–313.
. 2012. Programmed cell death 1 forms negative costimulatory microclusters that directly inhibit T cell receptor signaling by recruiting phosphatase SHP2. J. Exp. Med. 209: 1201–1217.
. 2009. LFA-1 regulates CD8+ T cell activation via T cell receptor-mediated and LFA-1-mediated Erk1/2 signal pathways. J. Biol. Chem. 284: 21001–21010.
. 2011. Initiation of TCR phosphorylation and signal transduction. Front. Immunol. 2: 72.
. 2012. Role of LAT in the granule-mediated cytotoxicity of CD8 T cells. Mol. Cell. Biol. 32: 2674–2684.
. 2007. The differential regulation of Lck kinase phosphorylation sites by CD45 is critical for T cell receptor signaling responses. Immunity 27: 425–437.
. 2013. TIM-3 does not act as a receptor for galectin-9. PLoS Pathog. 9: e1003253.
. 2003. The tyrosine phosphatase CD148 is excluded from the immunologic synapse and down-regulates prolonged T cell signaling. J. Cell Biol. 162: 673–682.
. 2007. Analysis of protein complexes using mass spectrometry. Nat. Rev. Mol. Cell Biol. 8: 645–654.
. 2010. CD45-Csk phosphatase-kinase titration uncouples basal and inducible T cell receptor signaling during thymic development. Immunity 32: 342–354.
. 2013. Molecular pathways: coexpression of immune checkpoint molecules: signaling pathways and implications for cancer immunotherapy. Clin. Cancer Res. 19: 4917–4924.